Gout occurs when your body deposits uric acid crystals into the joints or soft tissues, causing inflammatory arthritis, which results in pain, swelling, heat and joint stiffness. Purines are natural substances found in the body and most foods; however, some foods have a high concentration of purines. An excess of purines in the body can lead to higher levels of uric acid, a byproduct of purine breakdown. And high uric acid levels can exacerbate gout conditions. If you have gout, choose foods low in purines so as not to worsen your condition. 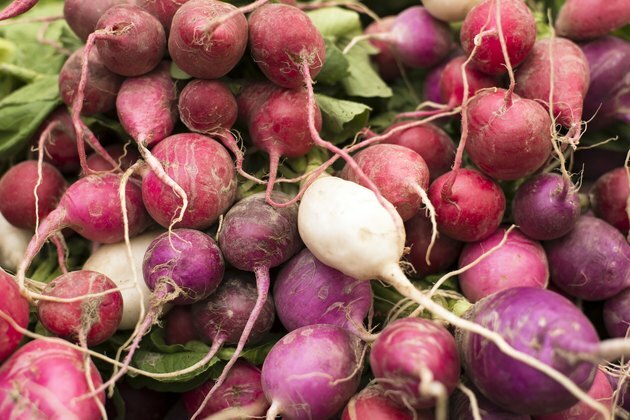 Radishes are a good vegetable to eat if you have gout because they are low in purines. They are also a good addition to a healthy diet because they are low in calories and have fiber and vitamin C. One cup of raw radish slices has about 20 calories, 2 grams of fiber and around 17 milligrams of vitamin C. There is no scientific evidence to indicate that radishes are a treatment or remedy for gout, however. You can eat radishes as a regular vegetable choice if you have gout, but they likely will not improve your symptoms independent of a diet that is overall low in purines or medication for gout prescribed by your doctor.